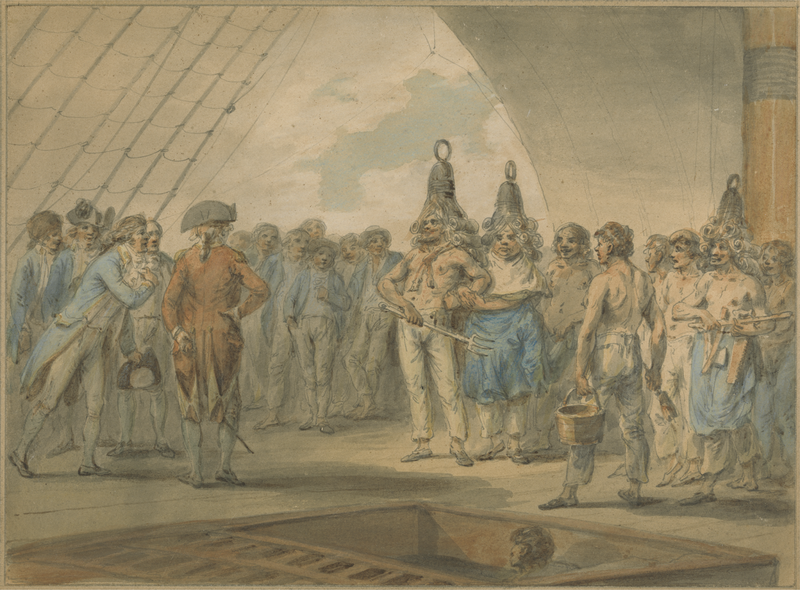 "Crossing the Line Ceremony on Board the Ship, 'Vestal,'" Julius Caesar Ibbetson, c.1788, Yale Center for British Art. In 1787, Ibbetson was appointed draughtsman to Colonel the Honorable Charles Allan Cathcart, who had been named Great Britain’s first ambassador to China...When Cathcart received his ambassadorship to China, he was vested with full powers from George III and the Honorable East India Company to negotiate a commercial pact with that vast realm’s emperor. Cathcart and his party boarded the twenty-eight gun frigate, HMS Vestal, in 1788, and set out for East Asia. Unfortunately, Cathcart died while as the Vestal passed through the Straits of Banca on June 10, 1788. He was only twenty-nine. The scene depicted here is the time honored Crossing the Line Ceremony. Even today, when a sailor passes the equator he is transformed into a "shellback." The coming of age ceremony is presided over by a sailor playing the part of Neptune (joined by the Royal Concubine), and often involves humiliating and even dangerous activities like dunking or forcible shaving. 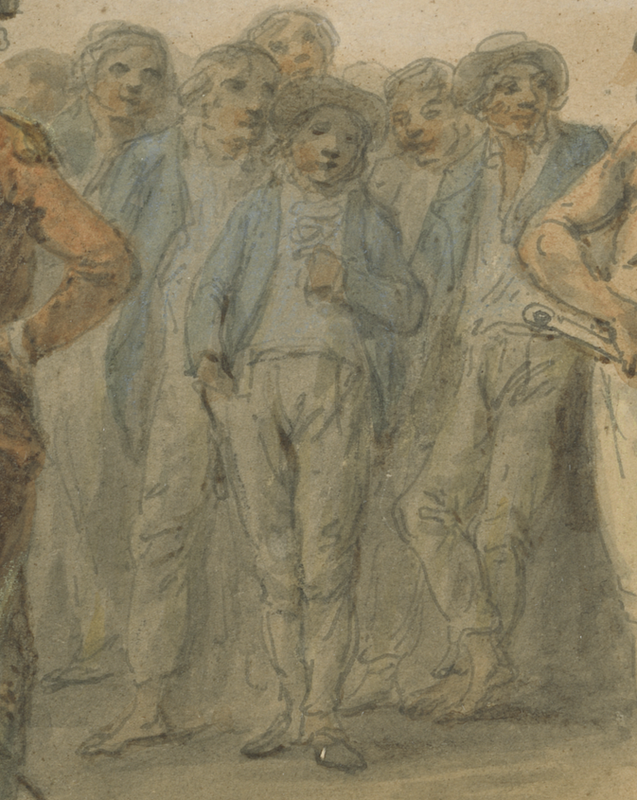 As Captain Fitzroy of the Beagle would later write in the nineteenth century, "The disagreeable practice alluded to has been permitted in most ships, because sanctioned by time; and though many condemn it as an absurd and dangerous piece of folly, it has also many advocates." Watching with interest, a group of tars are gathered at the rail. Not a one wears a waistcoat, but all wear blue jackets and white shirts. One at the center wears a pair of shoes, but most are barefoot. One wears a round hat in the style of the late 1780s: a tall cylindrical crown bordering on a top hat. All of the sailors wear white trousers, at least two of which have a broad fall fly. Arm in arm with the Royal Concubine, Neptune stands tall and proud. The sailor appears to have a painted on mustache and perhaps a genuine goatee. Though bare chested, he has still chosen to wear his orange/red neckcloth. Like the tars to the left, he wears a pair of white trousers with a broad fall fly, just like his Concubine. Both of them wear black shoes, though the detail is too scant to draw any conclusions about the style of buckles they wear.